Shrouded in mystery and infamy, BRUERIA have created a lore that never ceases to amaze and intrigue. It has been over twenty years since a diabolical group of individuals first came together and started what was unbeknownst to them would be one of the most controversial and legendary bands to play music. BRUJERIA has not relied on any forms of promotion for their releases. The success is directly due to a grass roots support of Latino and metal music enthusiasts. Despite known contributors in a live setting and on recording, the main forces behind BRUJERIA are still unknown. Although BRUJERIA has attracted musicians from bands like, Napalm Death, Carcass, Faith No More, Cradle of Filth, At The Gates, the core members of the band continue to create politically charged, social unacceptable, and morally brutal music. 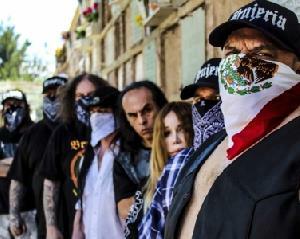 The controversy behind BRUJERIA has made news across the planet, receiving television news attention from Telemundo regarding decapitation murders in Texas, a Latin Billboard Award nomination in the same category as Shakira, and even receiving appraise from Subcamadante Marcos the leader of the EZLN, who’s soldiers have shown their support by wearing Brujeria tshirts!